After this, Jesus traveled around Galilee. 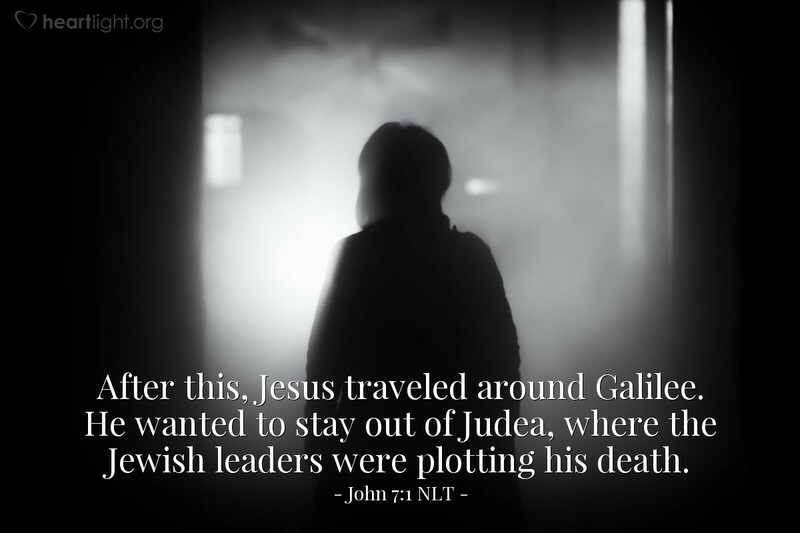 He wanted to stay out of Judea, where the Jewish leaders were plotting his death. Jesus stays away from Judea ... at least for now ... until the time is God's time. Jesus will not be hurried or rushed by the agenda of others. He follows God's timetable, not ours or his family's or anyone else's. He concentrated his work on teaching people who needed God's grace and the places that were ready to receive his message. He was wise and prudent even under pressure, and he didn't allow the threats to curtail his service. What a powerful message for us today, especially for those of us who sometimes find ourselves in horrible and challenging circumstances. Give me strength, O God, and a pure heart for my journey to you. Don't let me be deterred by those who would seek to dilute my faith or derail my sense of mission. At the same time, dear Father, please help me honor the people around me with respect. Give me the wisdom to know how to honor those I should honor while remaining true to you. In Jesus' name, I pray. Amen.